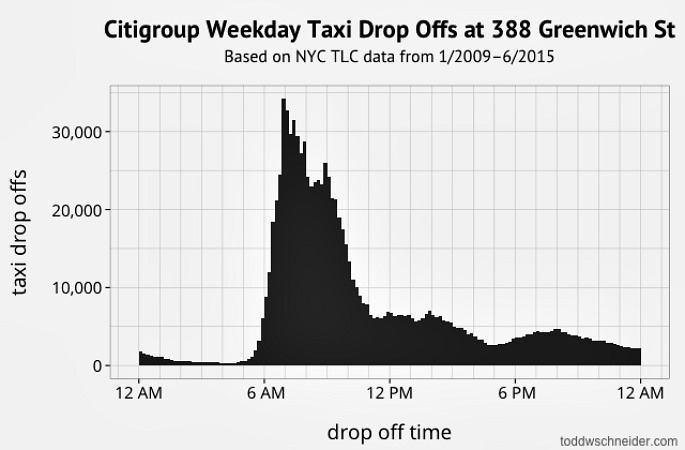 Using the TLC’s public data, Schneider also created charts and maps that show taxi travel compared with uber rides; weekend destinations of bridge-and-tunnelers; a late-night taxi index; how weather affects taxi trips; weekday drop-offs at Goldman Sachs and Citigroup; airport traffic; cash versus credit card payments; and the dramatic increase in North Williamsburg taxi activity. 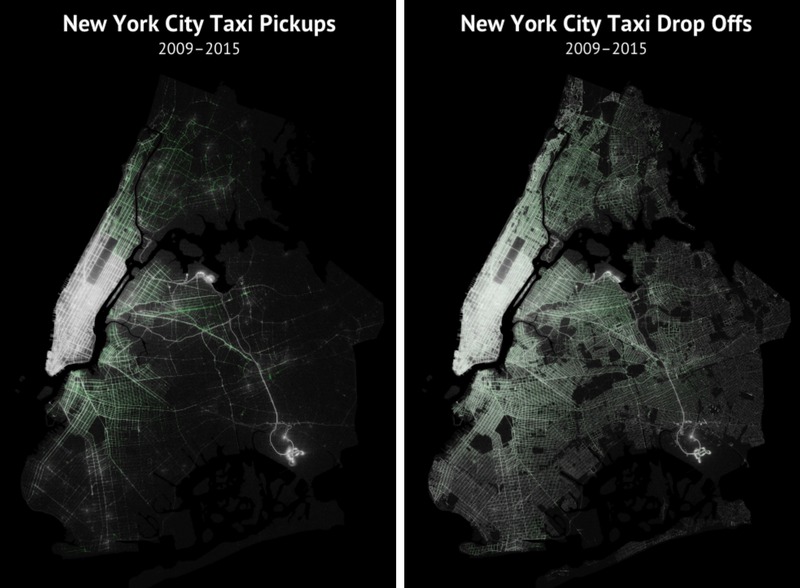 Above is a GIF showing the transformation of North Williamsburg taxi activity from 2011 (when the green cabs were introduced) to 2014, the area with the largest increase in taxi pickups. 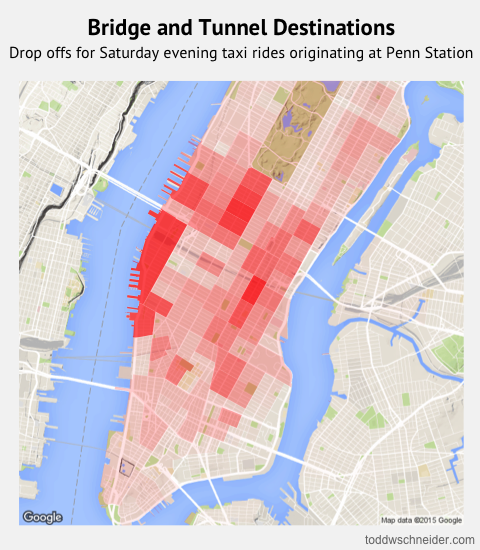 72 percent of these pickups occurred late night, and we can see some of the specific spots where this is most prevalent, such as the Wythe Hotel, Output nightclub, and Verboten nightclub. It’s also interesting to look at where those from neighboring locales go on the weekend. 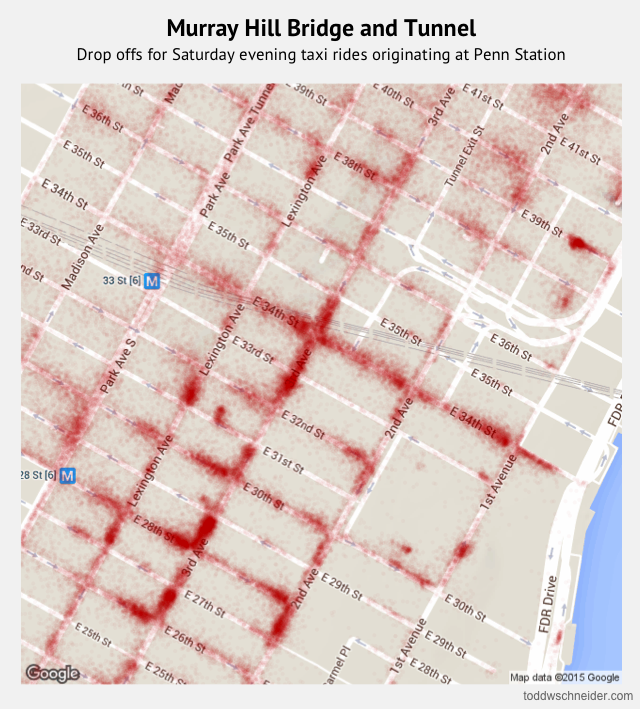 Though the first map above shows taxi pickups originating at Penn Station, most passengers are not going very far, ending up in the Meatpacking District, Chelsea, and Midtown. Not surprisingly, Murray Hill is the number one drop off spot, often known as the heart of the bridge and tunnel crowd. 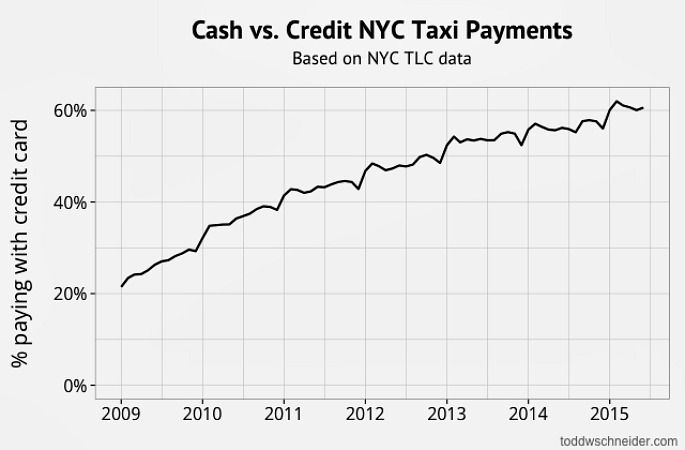 “We’ve already covered the hipsters of Williamsburg and the B&Ts of Murray Hill, why not see what the taxi data can tell us about investment bankers, yet another of New York’s distinctive subcultures?” asks Schneider. 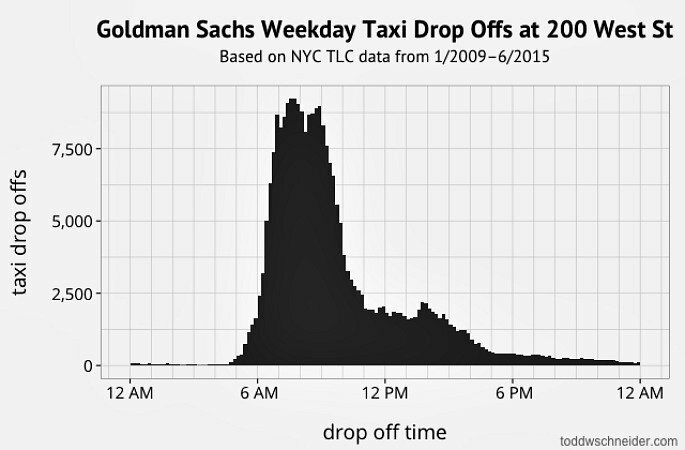 As his graphs show, Goldman Sachs employees’ average drop off time is 7:59 a.m.; Citigroup is 7:51 a.m. Those taking taxis to these offices mostly get picked up in the West Village, Chelsea/Flatiron/Union Square, and Soho/Tribeca (in that order).